It cannot be understated just how huge and important the first two Terminator films are. They are both among my top ten list most influential science fiction/sci-fi films of the last 45 years and are examples of how Writer and Director James Cameron can take a sci-fi saga and in one sequel not only surpass or at the very least equal the original, but can satisfactorily conclude a story in two films instead of stretching something longer than it should be with a trilogy or more. He proved this not only with Terminator 2: Judgment Day, but also with Aliens. Sadly Hollywood seems to be bent on spoiling these explosive films by creating unnecessary sequels by committees. I wish they just left both the Alien and Terminator franchises alone after Aliens and Terminator 2: Judgment Day respectively. 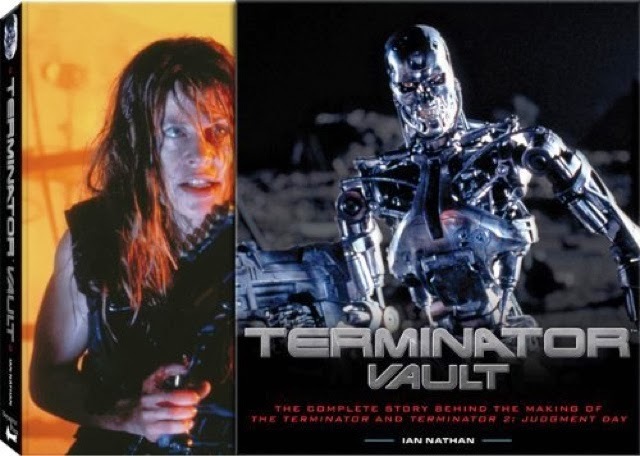 As he had with Alien Vault, Author Ian Nathan covers The Terminator and Terminator 2: Judgment Day with unprecedented detail in his recently releases book, Terminator Vault: The Complete Story Behind The Making Of The Terminator And Terminator 2: Judgment Day published by Voyager Press. Books like Terminator Vault are examples why there will always be physical tactile copies of works in print because no degree of technology can capture the feeling of holding a book of substance in one's hand. Like his book Alien Vault before it, Terminator Vault features replica inserts within little pockets found throughout the book where relevant of concept artwork by Cameron, effects storyboards, a diagram of the T-1000 by the late Stan Winston plus there are new interviews with James Cameron, Producer Gale Anne Hurd and even a foreword by Arnold Schwarzenegger, the man who became arguably the biggest action hero of all time as a result of these two films and one has to note that he is the villain in the first film! The book also includes reproductions of the original Sarah Connor photograph taken at the end of the first film, a T2 Crew pass, various handwritten notes and letters. It also delivers a taxonomy of all the various Terminator models featured not only in the first two films, but also the third and fourth movies, the Universal theme park 3D film experience and the FOX television series. Cameron's sophisticated backstory to Skynet, including it's origins and motives, are surprisingly prophetic of not only for where the films went, but how technology has evolved since the first film was produced. Even the psychological reasons for Skynet creating Time Travel technology and it's apparent intended use of John Connor as a sort of messianic warrior that delivers humanity from the future war against the machines predates what is learned about Neo's origins in The Matrix Trilogy and particularly his encounter with The Architect in The Matrix Reloaded.